Thirty-four years into their career, Phish found new ways to surprise their obsessive fan base during their 13-night “Baker’s Dozen” residency at Madison Square Garden, which wrapped up Sunday night. The band didn’t repeat a single song during the run, which included 26 sets of music, 237 songs total. Taking loose inspiration from flavors of designer donuts distributed at the door each night by the Philadelphia-based Federal Donuts, the Vermont quartet debuted a slate of songs that ranged from a 1920s blues standard to a 2007 viral video, from underground Seventies funk to 21st-century art rock. The audience was hardly limited to those inside MSG, or even listening in real time, with the band webcasting the shows and archiving them via their LivePhish platform. 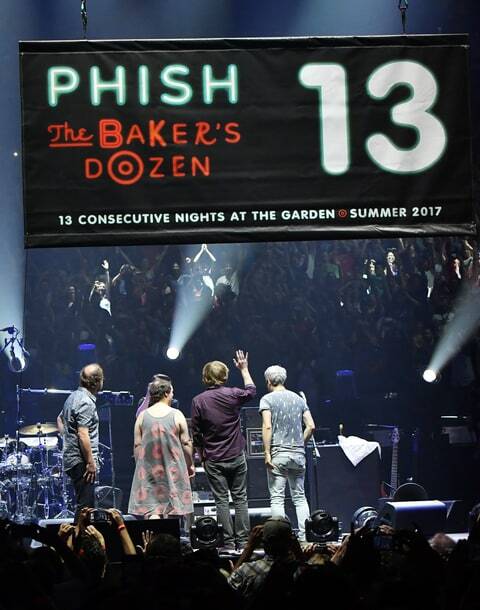 The Baker’s Dozen was one of most ambitious seasons of Phish in years: three weeks’ worth of twist-filled musical episodes for an engaged fanbase and onlookers wondering if it’s too late to get in on the joke. Here are some of the highlights. It’s a wonder it took Phish so long to cover Shuggie Otis, whose rainbow-colored psychedelic funk is a perfect match for the quartet’s ongoing cartoon dance party. A Number Five hit for the Brothers Johnson in 1977, “Strawberry Letter 23” is the new cover most likely to keep a Phish set at full blaze with its slinky groove and space break. Not all of the band’s flavor science paid off – the hippie blues reading of “See That My Grave Is Kept Clean” by Blind Lemon Jefferson seemed a bit undercooked. But mostly Phish stuck with fun, and the fun won out, from the full-band arrangement of Tom Waits’s “Way Down in the Hole” (Night 10) to guitarist and ringleader Trey Anastasio’s Hendrix-style “O Canada” solo to open Night Nine (Maple night) with spotlight on the Canadian flag in the rafters. By the last night of the residency, fresh bootleg shirts could be spotted in the Garden’s aisles: “Is This Still Lawn Boy?” Referencing the half-hour Night Four version of Page McConnell’s lounge crooner spotlight, usually only three-and-a-half-minutes long, the jam came early into a show that has already entered into the ranks of Phishhead lore. As keyboardist Page McConnell strapped on James Brown’s former keytar, the quartet used a spluttering dance groove as a launching point, sailing through arena peaks, sparse funk lowlands, seas of default riffage and stormy guitar heroics. It landed elegantly into “My Friend, My Friend,” itself earning a jam it never previously had. Immediately jumping to number two on the phish.net fan list of Top Rated shows, in between performances from 1998 and 1999, the night of the Jam-Filled donut served as a recalibration for band and fans alike. While many of the subsequent first sets stayed almost disappointingly within their bounds, sometimes filled out with juvenilia (“Alumni Blues,” Night Sevent; “Camel Walk,” Night 13), “Lawn Boy” established an anything-can-happen mood for the duration of the run. Phish fans ticked off classics and fresher material alike from a Google Doc keeping track of the songs played. But no spreadsheet could predict where the true surprises would come. With little of the goofy funk that makes Phish so unpalatable to non-noodle dancer types, 2004’s “A Song I Heard the Ocean Sing” unwound into one of the most inventive jams of the residency. From a curling Anastasio solo and a warm bed of Page McConnell’s Rhodes, the improvisation expanded quickly into a four-person dialogue, each player moving between rhythm and lead in an easily discernible but unpredictable musical conversation that followed little of their usual tension-and-release dynamics. Featuring a rare tonally ambiguous jam (as Phishhead musicologist Mike Hamad excitedly tweeted), it was a dark swirl, one of several deep-space excursions during the Baker’s Dozen. Another one worth listening to: a quiet but richly detailed noise valley during a half-hour version of Talking Heads’ “Crosseyed and Painless” (Night Four). Debuted during a week of shows running up to the Baker’s Dozen, the new song by Anastasio and longtime lyricist Tom Marshall was one of a handful of brand-new Phish songs. Extrapolating a knotty intro riff into a short jam recalling the twisted jazz moves of early Nineties favorites like “Stash,” the song also felt far from polished. Where Phish once played their not-yet-classics at nearly every show, tightening into dynamic arrangements over long tours, the band’s newest songs rarely get more than a handful of performances a year. Even without no-repeat stunts like the Baker’s Dozen, it can take tours upon tours for a song to enter the Phishhead canon. A faux-reggae tune from their college years in Vermont, often dusted off for no reason other than to play a faux-reggae tune, “Makisupa Policeman” dissolved almost imperceptibly into the long-delayed live debut of “End of Session.” Itself shaped from a delicate studio improvisation and overlaid with vocals, the final track from 1998’s Story of the Ghost served as a coda for the second part of the Jam-Filled Night Four. Even without unexpected songs like “End of Session,” Phish would still end up with at least several shows’ worth of unplayed material by the run’s end. “Make Phish Evil Again” read the all-too-familiar red hats appearing around Phishville, throwing shade on the bright jams preferred by the band’s most recent iteration. Those fans got their wish on Donut Hole night, when Phish let the bottom drop out of a “Mike’s Song” jam, flooded the stage with smoke and delivered a creepy a cappella “O Holy Night” before floating into a soaring “Taste” that broke free from its syncopated tether into (according to the delighted musicologists) a jam that modulated twice. Christmas in July on August 2nd. Aided by a synth, the band opened their second Friday show by gathering at the front of the stage for a mostly a cappella version of Tay Zonday’s 2007 viral hit “Chocolate Rain,” mimicking the video’s exaggerated “I move away from the mic to breathe in” gestures. Re-embracing the barbershop-quartet arrangements in recent years, the band concluded the show with their detail-filled a cappella take on David Bowie’s “Space Oddity.” Other barbershop visitations included the early-20th-century spiritual “Dem Bones” (Night 11), and debuts of the Beatles’ “Strawberry Fields Forever” (Night Two, sadly missing the “cranberry sauce” outro), Harry Nilsson’s “Coconut” (Night One), and the Fleet Foxes’ “White Winter Hymnal” (Night Five). 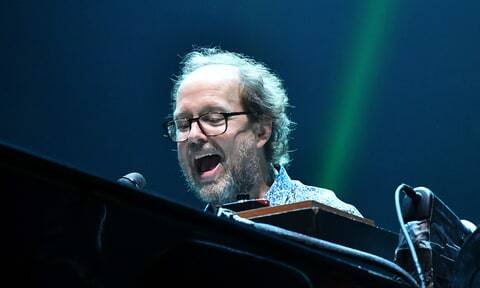 For instant chills, listen to the recording of Phish fans realizing that Page McConnell is playing the keyboard intro to Radiohead’s “Everything in Its Right Place,” coming out of a bubbling 15-minute jam on “No Men in No Men’s Land.” With Anastasio pitch-bending Fishman’s vocal through a KAOSS pad, and looping the thematically appropriate “sucking on a lemon” line throughout the set, it was an extended moment of Phish dada. But, while perhaps giving the band new space-jam moves, Phish might have been overmatched by the delicacy of Nigel Godrich’s fractured production on the original. Phish’s early and complicated epic has become a meme of its own, with Phishheads holding up “FLUFFHEAD” signs at sporting events and other public sites suitable for televised photobombing. Played to the hilt to conclude the sequence that included “Everything in Its Right Place,” Phish’s whimsical tendencies never seemed more out of time, or more useful. The poetic lyrics to “Fluff’s Travels” – a song with virtually no jamming – are perhaps Phish’s best, a portal to the prankster innocence of their early years. Opening the last set of the residency, “Simple” zagged through several of the band’s favored (and sometimes predictable) jam modes over its 24 minutes, including a series of successive peaks near the end. With Phishheads dividing the band’s history into three parts according to the quartets hiatuses (which occurred between 2000-2002, and 2004-2009), this year has already been the jammiest of the so-called 3.0 period. As “Simple” disassembled into a quiet cartoon conversation, McConnell took to the theremin for the first time in a half-decade, adding a ghostly electronic whistling for all of a minute before returning to his keyboard station, a punctuation rather than a statement. It was nearly a given that the residency would end with “Tweezer Reprise” to bookend the version begun on Night One. First came a brief call-back to “Lawn Boy” (with McConnell quoting the new bootleg shirt) and an emotional version of Willie Nelson’s “On the Road Again,” before – finally – “Tweezer Reprise.” As they launched into it, waves of confetti exploded into the air over the venue floor, a new cloud each time the song hit a new peak, courtesy of a drama-minded fan or three. By the time the band brought the song, show and entire Baker’s Dozen run down for a landing, a piece of silver foil dangled from Anastasio’s guitar neck, the stage littered as if it were New Year’s Eve.